With the help of her guides, she consciously recognized that she no longer had to war against her partners to keep from losing them. What type of a relationship are you in? Does your partner validate your emotions and help support who you are? Are you with someone who enriches your life? If not, why not? Answering these questions can often be a complex process of recognizing energies we are holding from past lives that have been triggered by current-life events. Relationships are challenging. We sometimes choose people and partners that unconsciously represent past emotions that need to be resolved. In an attempt to consciously recognize — and heal — these past hurts, we recreate these emotional events. 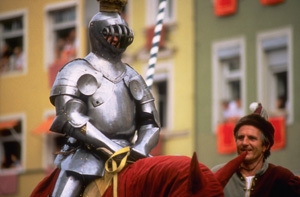 I recently conducted a session with a wonderfully powerful woman who had lived a past life as a knight. In this particular past life, her goal was to unite two divided principalities, France and England. As the knight, she was born in Italy, raised in France and resided in England. Because she felt allegiance to both France and England, the mounting tension between the governing bodies of the two principalities caused her distress. And since she was about to be married to an English noblewoman, she especially desired peace between the two principalities. Peaceful relations were not to be. Before the marriage, war broke out in spite of a treaty and the English noblewoman was murdered. This wonderful woman brought the grief, frustration and warring energy from her life as a knight into this current lifetime. Further, in this lifetime, she had lost her father at an early age and had been sexually abused. Those events acted as triggers that carried over the emotional energies from that particular past life. Because she was unconsciously carrying all these negative emotions, she was acting out all of them at once. She was failing to create the relationship she wanted because she was already in grief for its loss. And once she was in a relationship, she would war against it in deep frustration that the unity she wanted was not present. In her relationships, she unconsciously believed unity was impossible. With the help of her guides, she consciously recognized that she no longer had to war against her partners to keep from losing them. In fact, she could now release all the divisive energy that dwelled within her and allow herself to unify her energy by recognizing that she could have her desires met inside a stable relationship. She was guided to participate in a meditation in which she asked for unification and release from the energies she no longer needed to empower her. She has cleared the energy for the relationship she is now ready for. With conscious awareness of our energy and how it is manifesting, we can bring our dreams to fruition. Rochelle Sparrow, MSW, LCSW, is a psychic trance channel, host of The Rochelle Sparrow Connection on www.bbsradio.com, and a trained therapist and transchannel. She offers individual, couples and group trance channeled sessions. www.rochellesparrow.com, info@rochellesparrow.com or 602-430-6447.